Given All The Hand-Wringing Over South Dakota Being A Low-Wage State, Why Is There Even A Conversation Over Initiated Measure 18? Pass The Thing, For Crying Out Loud. I think the South Dakota Retailers Association (of which I'm a dues-paying member in good standing) is nuts to be putting up such a spirited fight against Initiated Measure 18. It's the ballot issue that will immediately raise the minimum wage in South Dakota from $7.25 to $8.50 an hour and provide for annual cost of living increases every year thereafter. Along with SDRA, the South Dakota Chamber of Commerce and Industry also opposes the measure, the general argument being that being forced to raise wages for their lowest-paid employees will actually decrease employment. I think that's basically a lot of hooey. The non-partisan South Dakota Budget and Policy Institute last September did, in fact, conclude 357 South Dakotans would lose their jobs over the increase, but in a state with 450,000 workers that number is so statistically insignificant as to be meaningless. In that same SDBPI report, the institute notes that about 1 out of 6 South Dakotans would see wage increases if IM 18 passes. That's about 17% of the workforce, or 77,000 people, and it makes me pose this question: Retailers and Cof C types, aren't you missing something? While you rail against employers being forced to raise wages from exploitative to merely sub-subsistence levels, consider that nearly 80,000 South Dakotans will be getting an extra couple of hundred bucks a month to spend in your businesses if IM 18 passes. Do the math. That's 15 million bucks a month! Who's the genius at the Retailers association that's so dead set against that? Meantime, I want to meet the SDBPI economists who thinks that sudden surge of spending is likely to result in a loss of any jobs whatsoever. First thing I'd show them is a report last Summer from the Center For Economic Policy and Research that shows exactly the opposite. The CEPR report cites a Goldman, Sachs study showing that the 13 states that raised their minimum wages at the beginning of 2014 have experienced faster job growth rates than the 37 that haven't. I have absolutely no doubt whatsoever that in every one of those states that raised the minimum wage there was a cadre of doubting Thomases from the business community who insisted that job losses would occur as a result. The fact is, reality and common sense have proven them wrong. I see in the Rapid City Journal today that the editorial board recommends a No vote on IM 18, explaining that market forces "tend to do a good job" of setting wages. I really couldn't disagree more, and I believe that the labor shortage in South Dakota contradicts the notion that market forces here have done a good job of "managing who gets paid what," as RCJ put it. Governor Daugaard himself set a tone of serious concern about our labor situation by initiating a series of "workforce summits" to address the issue in 2014. I believe if the labor market were efficient in South Dakota, that chronic worker shortages wouldn't be the bane of economic growth in this state. This is a situation where voters can indeed kick start the state into a realm of competitive wages, because the organizational stasis evidenced by South Dakota's leading business organizations won't get us to budge off our low-wage, low-job numbers dime. The trees of marginal cost increases created by higher wages are blinding opponents to the forest of a surging economy. IM 18 puts more spending cash into the hands of the very people who are responsible for the strength of our economy in the first place. SD's Initiated Measure 17 (The "Any Willing Provider" Initiative): Not So Much About "Patient Choice" As It Is About "Choice Patients"
"The more I look at Initiated Measure 17 the more I think it’s less about “patient choice” and more about some doctors wanting to take the “choice patients,” namely those who now can afford fairly comprehensive insurance coverage that can be extended to even the most expensive caregivers. That changes if the measure passes, because then everybody effectively becomes a “choice patient.” Health insurers in South Dakota would have to drop their “preferred provider” lists of physicians and hospitals and include “any willing provider” of medical services among their participating doctors. The problem with upending the status quo is that by spreading the pool of insured South Dakotans out over a broader field of physicians, care is likely to get costlier just because economies of scale will be lost to existing preferred providers. They’re likely to lose a significant number of patients who will migrate to any number of newly participating providers. That means less revenue to cover fixed costs, which will result in their raising fees to insurers in order to remain in the black. I’ve seen enough academic studies (from universities including George Mason, Minnesota, and Southern Cal, among others) to regard this as a valid contention, one which is also supported by the fact that the SD Chamber of Commerce and Industry opposes IM 17, mainly because it will likely result in a jump in employer insurance costs as fees from providers across the board increase and the higher costs are passed on to customers. But compelling as the pro-con arguments are when they’re focused on costs to both consumers and physicians, I’m more concerned about the effect of IM 17’s passage on care to the poor given by non-profit healthcare facilities like Rapid City Regional Hospital, which provided me with data from the Center For Medicare and Medicaid Services (CMS.gov). According to the Center, South Dakota’s non-profit hospitals provided $36 million in charity care in 2011, a figure over and above Medicaid reimbursements. At the same time, the report notes that South Dakota’s specialty hospitals wrote off just $196 thousand. Considering that much of that care is effectively subsidized by fees received from insurance companies for other services, a drop in the revenues created by RCRH’s insured patients would strain the hospital’s ability to provide charity care. As to those specialty hospitals? I doubt they’ll use their windfall of newly generated fees from insured customers to begin serving the neediest members of our community with charity care. The fact of the matter is that patients can already choose to go to specialty care centers if they’re willing to pay more for coverage that would include those higher cost services. As things will stand if IM 17 passes, choices are eliminated because everybody will have to pay more for a high-end policy that covers fees from a broader network of providers ultimately charging more money." Pressler The Pragmatist Came Off Pretty Well In Tonight's KELO Senate Debate. I haven't been much of a fan of Independent Larry Pressler, either during his years in Congress (as a Republican), or now in his poltical dotage trying to capture the U.S. Senate seat that he lost to Tim Johnson way back in the 90s. But after an hour of some heated go-rounds in tonight's televised debate, Pressler impressed me in an unexpected way--he came across as the most reasonable and realistic pol in the entire bunch. Maybe it's a holdover from his legislative, compromise-demanding days in Congress (late '70s-mid 90s), maybe it's just a sign of wisdom that comes with age--and maybe it's just that his style isn't combative but conciliatory by nature. Whatever it was, it came off well. When the matter of the Keystone XL pipeline started drawing table-thumping harangues, cheering and sneering from Rounds, Weiland and Howie, Pressler rather calmly explained that he wasn't particularly for or against the pipeline itself, but rather for a different route, passing eastward through North Dakota and south through Minnesota to refineries in the Midwest. In one masterful diversion, Pressler deftly avoided the economic and environmentsl arguments and came up with a suggestion that suits everyone. When gun control took center stage and Republican Rounds and Democrat Weiland were tearing each other up over who most firmly embraced the 2nd Amendment and the matter of background checks, Pressler kept his cool. He explained that he was for the Dole plan, which I checked on to find that former Kansas Republican Senator Bob Dole essentially called for harsher penalties on criminals toting guns and some limited background checks. There wasn't anything around that could be called a "Dole Plan," but from memory and this nice piece about the aging senator from Kansas in a Wichita paper last year, I could see where Pressler's coercive, not combative, style got its inspiration. Dole was a master at creating alternative proposals and presenting them as an option when competing interests couldn't reach a compromise. Pressler came across just like that tonight, and it sure seemed like an amiable reasonableness. After Mike Rounds spent much of the evening tearing President Obama down on policy after policy, calling him all wrong for South Dakota in an obvious appeal to what seems to be a visceral hatred of the President among many of Rounds' supporters, the people near me noted that it was refreshing to hear Pressler remind everybody that Obama is still the President and that South Dakota's incoming Senator would have to work with him for a couple of years. Imagine a Congressional candidate acknowledging that he'll actually have to work with opposing politicians in Washington. What on earth has this world come to? Filled with passion and hatred, Rounds for Obama and Weiland for rich folks, the mainstream candidates were predictably animated, which I guess is part of their job description . . . but the histrionics did get tiresome. Meantime, eternal outlier Independent Gordon Howie kept bobbing up with a reminder that he's the only true conservative in the bunch, as if we needed to hear it again for the umpteenth time. And then there was LP. Maybe it just fell to him, maybe it's just because that's the way he is, but Larry Pressler turned out to be the composed and senior statesman in the crowd. He did himself a lot of good tonight. Rick Weiland's Tirade Against The National Democratic Establishment Is Way Off Base. And Demeaning Too. Rick Weiland's unseemly outburst against the Democratic Senatorial Campaign Committee yesterday was squirm-worthy and sad. He basically accused the DSCC of sabotaging his senate campaign by running attack ads against Republican Mike Rounds, which made Weiland look mean and nasty as a result. That the strategy may have misfired is one thing, but to call it a deliberate act of sabotage? Weiland is nuts. DSCC is scrambling to hold on to its U.S. Senate majority, and it just started pouring serious money into Weiland's campaign a few weeks ago when it looked like the open seat here, once thought to be locked up by Mike Rounds, was actually in play. Now all of a sudden this is a party that's trying to work against one of its own just as Weiland looks like he might be able to pull it off? Come on. Even more delusionally, Weiland accused his own party of scheming to derail his campaign in favor of Independent Larry Pressler's. Weiland claimed that "my national party--that I'm a member of--was trying to drive votes to Larry Pressler and trying to drive up my negatives." That strained political calculation would mean that DSCC was further trying to split the anti-Rounds vote, essentially handing the election over to the GOP. Much as I like Rick, I think the stress of this campaign, added to a just-released batch of polls showing that Rounds has widened his once-tenuous lead, got to him. The episode is also a pretty clear indicator that Weiland just won't accept the fact that ultimately he's responsible for his own fading fortunes. Finger pointing is not becoming to a composed and self-confident leader. Throw in the shrillness of Weiland's outburst and the whole thing comes off as a tantrum that just doesn't sit well with friends and makes for a gleeful source of mockery from his enemies. What Weiland may probably never get is that his campaign is a dud from the get-go. Rick's prairie populist theme is about two generations behind the times. USA Today last year did a piece on disappearing prairie populists and asked, "what is left of the political breed?" The question is asked with good reason. Weiland keeps urging his supporters to "take it back," but the meme never got much traction. Why? Because the era of small farmers and tradesmen who felt exploited by the big banking and political interests back east, those men and women of the soil and the small towns who made the careers of political giants like Truman and Humphrey, don't dominate the social landscape of South Dakota anymore. You just don't have a bloc of small family farmers, classically waving their fists at those "rich folk back east" who manipulated commodity prices and had the politicians in their pockets back then. Nowadays farms are sizable enterprises, and like all sizable enterprises, they identify with the elements of the very power-matrix that they once deplored. Telling these folks they need to "take it back" is futile. They're too busy scanning the grain and livestock futures boards at their laptops and hand-held devices while making sophisticated marketing decisions to pay much attention. In short, these people have learned much about controlling their own destinies, so much so that I believe there's an element of condescension to Weiland's quaint exhortation to "take it back." This is the tragic flaw of the Weiland campaign--not a paranoid scenario about a conspiracy within his own party to do him in. Raise Sales Taxes For More Teacher Pay? I'm Okay With It, But How About Reviewing Exemptions First? South Dakota teachers are ridiculously underpaid, and that goes on the basis of both national and regional comparisons. A nice graphic put out last Winter by the Washington Post shows the embarrassing news for all to see. Forgetting about comparisons with far-flung states, just look at South Dakota teacher salaries compared to those of our surrounding states. How on earth we get any of our outstanding and dedicated teachers to work here is amazing to me. The old canard that it's okay because living costs in SD are cheaper than elsewhere has long since been worn away by facts and data that I have yet to see challenged, much less refuted. Fact is, our teachers are undervalued. Given the results of some recent polling on how residents feel about this, I'd say most South Dakotans get it. In fact, South Dakotans get it so acutely that by a 2-to-1 margin, they favor increasing sales taxes during the Summer months in order to raise the cash needed to boost teacher salaries. I can't recall ever seeing a majority of that magnitude willing to increase taxes for anything. You'd have to conclude from this poll that a lot of South Dakotans are fed up with our status as collective cheapskates when it comes to paying our teachers. You can count me among them, but before we go jacking up tax rates let's pause and consider our sales tax system itself. 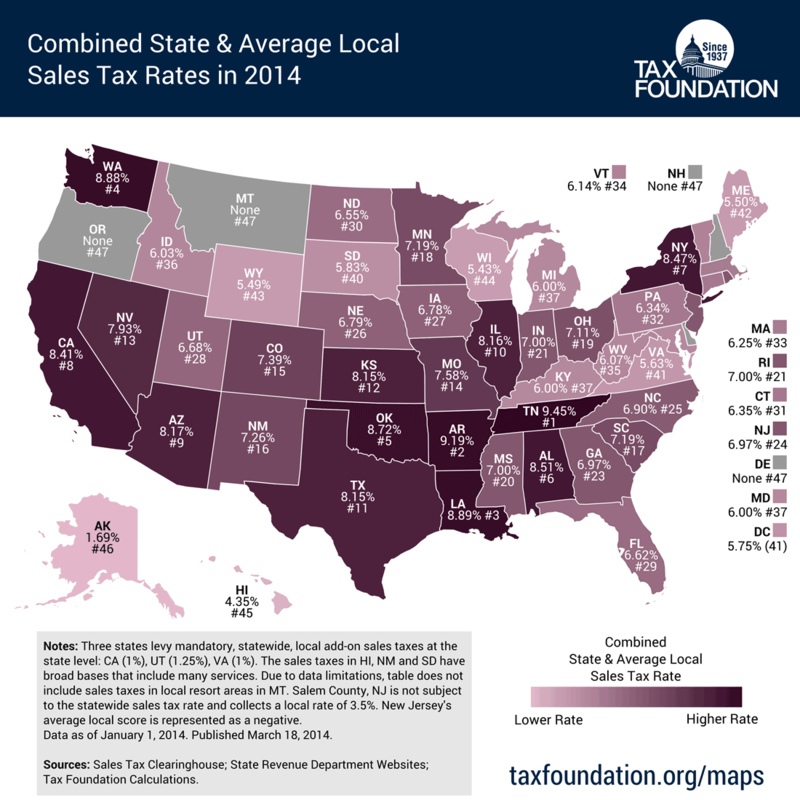 First off, per this graphic from the Tax Foundation, South Dakota ranks 40th in combined state and local tax rates. We've definitely got some room to the upside compared to the rest of the country. But even at that, there's a hidden trove of sales tax revenues that could be uncovered: I think there's money to be derived from reviewing the state's unbelievably long list of sales tax exemptions that totalled $582 million in 2013. Some of them are just plain ridiculous. For example, why should advertising services be exempted, to the tune of $7 million a year? Railroads get $10 million worth of exemptions. Credit card processors another $3 million, The list goes on. Financial services like brokerage and insurance agencies are exempt from $10 million. The ag industry gets $222 million a year worth of exemptions, which make for a long list, probably much of it justified, but given this era of $3.00 calves and $10.00 soybeans, I suspect that list could be compressed a bit without causing much pain to the ag sector. For example when my business needs equipment to be repaired, I pay sales tax just like everybody else. Why do farmers get $13 million dollars of exemptions when they get their stuff fixed? Nothing against farmers, but the bottom line here is that we're all in this together. By all means, let's look at sales taxes as a way of raising money for teacher salaries. But before we ding ourselves en masse, let's take a look at some of the special interests and their customers that could reasonably be expected to pay a little something for their goods and services just like the rest of us. Polls Are Bustin' Out All Over . . . All Over The Meadows And The Hills . . . If Mssrs. Rodgers and Hammerstein were Republicans they'd be giddy about the numbers showing up in a flurry of polls that just came out. I know, I know, it ain't over 'til it's over, but just the same it looks to me like a Republican sweep is about to happen in South Dakota's statewide races. Rounds has finally cleared the 40% hurdle in what's likely to be a plurality-determined senate race, his two major opponents having faded fast in the last week or so. NBC just came out with one on the governor's race showing Daugaard crushing Wismer by 40%. As they materialize over the next few days, I'm sure polls of all the races will confirm the big leads that Pubs have been maintaining for months now. Like probably a lot of my fellow Pubs, I'm feeling somewhere between okay to somewhat resigned about the situation--and I'm uncomfortably ambivalent about the likelihood that Mike Rounds will be our newest U.S. Senator. On the state level, it would be nice if Governor Daugaard's caretaking nature could be goosed up with some leadership and vision. And Attorney General Jackley's reluctance to come forward with a forceful "we'll get to the bottom of this" approach to the EB-5 fiasco only adds to a general sense that lethargy will remain the ongoing style among the top managers in South Dakota. As to the House race, much as I've disdained Kristi Noem since she stabbed her U.S. Government-dependent constituents in the back last year by voting to shut down the federal government, she will at least bring some experience and a long-time resident's knowledge of South Dakota-specific issues to the House of Representatives. Those are qualities lacking in her earnest but unprepared opponent Corinna Robinson. My hope for Noem is that she develops some sensitivity to South Dakotans and their needs before jumping on an ideological bandwagon like the one that almost wrecked the economy last year. As to Rounds, the final chapter on the EB-5 story has yet to be written. Obviously, he has a fair number of South Dakotans believing that it's a mere distraction--enough, anyway, to carry him to a likely victory by plurality next week. But he's told conflicting stories, along with mis-statements aplenty. Given that the FBI is "actively" investigating the matter, and given that Rounds' office was closely connected to the sizable (more than $100 million seems to be a commonly accepted and unchallenged estimate) ripoff of money that should have been South Dakota's, the federal investigation remains an unknown component of this story. Beyond that, there's the possibility that ethics reviews by the U.S. Senate itself may create some political and functional problems for Rounds. Tainted from the get-go, Rounds leaves much to be desired as our next Senator-elect. Most South Dakotans understand that, considering that if his plurality holds, 60% of us would rather have someone other than Mike Rounds representing us in the U. S. Senate. Denise Ross At The Mitchell Daily Republic Tots Up The Fees Collected From EB-5 Investors And Comes Up With $108 million. Talk About The "One That Got Away"
In a typically brilliant effort, Denise Ross at the Mitchell Daily Republic came up with an itemized list of fees collected by Joop Bollen's SDRC, inc. in yesterday's Mitchell Daily Republic. Bollen is the former state employee who worked jointly for the South Dakota Board of Regents and then-Governor Mike Rounds' office. Until 2008, he ran the "cash for green cards" program known as EB-5, collecting sizable sums of money (to the tune of $500 thousand a pop) from foreigners willing to invest in South Dakota-based projects in exchange for permanent residency in the United States. According to Ross' piece, the state of SD charged investors no fees for setting up projects with their money. That all changed in 2008, when, under the noses of his bosses at the BOR and the Governor's office, Bollen created SDRC, inc. to handle the EB-5 program, taking it away from the state via a contract with himself that he signed on behalf of South Dakota. That's when the fees started piling on. The fees that SDRC, inc., collected from the investors--fees that were charged in addition to the money they invested--amounted to well over $100 million by 2013, when current Governor Daugaard pulled the plug on SDRC, inc. and cancelled its tainted contract with the state. I've seen credible estimates of total fees collected that range from $120-$140 million, none of which have been challenged. This is fee money (not investment money) that EB-5 investors were perfectly willing to pay in order to get in on the action, fee money that could just as easily have gone to the State of South Dakota when the state was running the program. Bollen's realization of that fact and subsequent diversion of the fee money from the state to himself, how it could have happened, if it were the result of complicity or lax oversight, just who knew about the events--all of these are being questioned throughout the state. The Federal Bureau of Investigation also just announced that its investigation into the matter is active. We'll get answers soon enough. Meantime, the political price to Michael Rounds and his campaign for the U.S. Senate seat that's open this year is incalculable. The once popular Governor, who won two terms handily with substantial majorities, has been struggling to get out of the high-30s in polls. Rounds' EB-5 troubles no doubt have something to do with his lackluster support so far, but I haven't seen any breakdown that pins specific issues to support or lack thereof, which is why I say it probably can't be calculated. As to the amount of money lost to the State of South Dakota, I suppose that's open to conjecture. I'm inclined to think that everything collected by SDRC, inc., is money that was lost to Bollen's company once he got away with his scheme. Those who surmise that it might have been substantially less because Bollen's fees were significantly higher than those charged elsewhere in state-operated programs have a point, but it's a point based on speculation. I'm just going by numbers that look real and the fact that EB-5 investors weren't turned off by Bollen's fee schedules, which suggests to me that SDRC, inc.'s charges were acceptable to the market. I stand by my opinion that the amount of money taken in by Bollen's firm was money that just as easily gone into South Dakota state coffers. If you review Ross' itemized list of charges in the piece that I linked above, you'll see that this whole fiasco has been a very expensive mess for South Dakota. I can't conclude without a thank you to Denise Ross for the diligence and thoroughness she's putting into this story. Most appreciated, Ms. Ross. Powertech Uranium's Takeover By Some Shady Financiers In East Asia Moves Forward. Stock Market Is Underwhelmed. Powertech Uranium is the company that wants to punch holes into the southern Black Hills in hopes of extracting uranium from the water below. The process will forever alter the water quality, which is the subject of much debate in the scientific community. My view is that there's no margin for error when it comes to tampering with water, so I'm opposed to the plan. More compellingly, I wonder about the financial underpinnings of Powertech Uranium itself, especially as it's now moving ahead with its plans to unify with some Asian firms that have a downright shady history. One of the them is Blumont Mining out of Singapore, an enterprise that is in serious trouble with its regulators and the local police--a situation I brought up here a few weeks ago. Of more immediate interest is that the Toronto Stock Exchange, which is where Powertech stock is listed and traded, has just given conditional approval to this combination. My background in finance tells me that this should be good news for the stock, taking its price higher. Yet the immediate reaction to the news has been negative, with Powertech stock trading at an all-time low of just 3.5 cents a share in recent days. This merits some analysis, which I happily present here in the form of a blog post by Jim Woodward, a Colorado-based CPA who follows developments in this drama closely via his site Powertechexposed.com. NEW October 23, 2014 - The more things change, the more they stay the same, particularly when it comes to Powertech/Azarga's investor communications. Tuesday evening, Azarga officials were positively giddy as they tweeted out "Toronto Stock Exchange approved our merger..." and "$5m cash in the can and the highest grade project among US ISR peers". The next day, Powertech issued a news release that was more specific and not quite as upbeat. According to the release, the TSX "conditionally approved" the "merger" between Powertech and Azarga, the proposed $5 million private placement, and a proposed one for ten reverse stock split. True to form, Powertech did not fully disclose the TSX's conditions, only mentioning a four month lock-up period on shares issued pursuant to the private placement. And describing the transaction between Powertech and Azarga as a "merger" is misleading. The actual written agreement between the companies correctly describes it as a reverse takeover of Powertech by Azarga. The TSX refers to these transactions as "backdoor listings", because a privately-held company (Azarga) bypasses the initial public offering process and assumes the public listing of the target company (Powertech). TSX rules consider a transaction to be a backdoor listing if the transaction results in the existing shareholders of the listed company (Powertech) holding less than 50% of the voting power in the new entity, and if there is a change in effective control. In the proposed Powertech/Azarga deal, existing Powertech shareholders will be left with only 33% of the company, and control will shift to a handful of Azarga executives as well as controversial Singaporean firm Blumont Group. The fine print disclaimer on Powertech's news release notes that Powertech "expects" and "assumes" that "the TSX will approve the proposed transaction", implying that final approval has not occurred, and conflicting with the definitive statement made on Azarga's Twitter page. Perhaps this is why on the same day the news release was issued, Powertech's stock price dropped to an all-time low of three cents. One might expect that demand for Powertech shares would increase on the news, but the opposite was true. And today, the stock price rose to only 3.5 cents as a mere 30,000 shares were traded, worth only $1,050 CAD. Ethics? We Don't Need No Stinkin' Ethics. Come this morning's edition of The Nation and what do we find but a big story titled "Revealed: A New Ethics Scandal Involving The GOP's South Dakota Senate Candidate." Another story involving Mike Rounds and his political associates' ethical behavior is something of an October non-surprise these days, just a few weeks before the election, but the element that does stand out is the fact that the story has nothing to do with the ongoing Slaughterhouse EB-5 fiasco, which has been dogging the Rounds campaign for over a year now. This time it's all about activity that has taken place long since after then-Governor Rounds left office in 2011. The story goes into some detail, far too lengthy to break down into its elements here. But the gist of it is that Rounds' campaign manager Ron Skjonsberg is a member of a South Dakota state economic development board that last year granted nearly $800 thousand in economic assistance to a company called Novita LLC, along with a couple of extensions as timetables were pushed back, Turns out, according to The Nation, that Skjonsberg runs the investment firm, Lake Sharpe, that has an equity interest in Novita. It also turns out, per information published in The Nation, that Senate candidate Mike Rounds reported in 2013 that he had somewhere between $50k and $100k invested in Lake Sharpe. Is there a conflict of interest here? You decide. Is it a violation of state ethics rules? Sure seems like it. Responding by e-mail to the piece, Skjonsberg sent The Nation (you can read the full text of the e-mail in my link to the article) a carefully crafted response. In it he says that he has "come to understand that the perception of a conflict of interest has arisen" and that he has "taken steps to ensure the perceived conflict is avoided in the future." The italics are mine. The use of "perception" and "perceived" is very interesting. Does Skjonsberg use those words to imply that, though the "perception" exists, there was no actual conflict of interest? Personally I think he does, but that's just me. You might decide otherwise. In order to help you along with the decision, I note the following in the article: "[When] asked if the ethics rules prohibiting board conflicts of interests applied to Skjonsberg's votes on the Novita permit extensions, [J. Pat Costello, the Commissioner of the Governor's Office of Economic Development, which oversees the board], answering by e-mail, told the Nation, "yes, the ethics rules apply to all related votes including the extensions." So what Skjonsberg explains away as a "perception" of a conflict of interest is defined by his overseeing authority as a violation of ethics rules. Is an oversight involving this much money tied to both Skjonsberg and Rounds a plausible scenario, especially considering that the matter came to the board three times? I doubt it. But that's just me. I invite Skjonsberg to set me straight, right here. We had a chance to remove the Rounds Daugaard team from SD politics during the primary in June, but passed on that opportunity. So now we are faced with the option of doing so In November. Will we take that opportunity this time, or are we still going to give them a pass on their utter disregard for the citizens of South Dakota? 1. CAFO dairy operations two of which went bankrupt and at least one of which employed illegal immigrants not locals for the jobs as mandated by EB-5, and the others continue __to pollute our lakes and streams, and only hurt the small dairy farmers in our state. 2. The Big Stone II coal burner Power plant which after being fought for by our governor for years, was dumped by Minnesota's PUC as damaging the air and water surrounding it. 4. The Keystone Pipeline, environmentally damaging, and bleeding 38 million dollars from South Dakota taxpayers. 5. The Keystone XL pipeline which was originally approved by the PUC, but whose permits from SD have now expired. This was caused by the delays in approval because of __awareness of its potential to damage the ogallala aquifer, the largest aquifer in the US and which serves the SW quarter of our state. 6. Anderson Seeds, which cheated South Dakota farmers out of millions of dollars when it went bankrupt. 7. The Hyperion oil refinery and coal burning power plant which the Governor was promoting as the Gorilla Project for a couple of years. 8. Syphoning of millions of taxpayer dollars to Govenor Daugaard's former employer South Dakota Children's Home Society when he was Lieutenant Governor and still employed __by SDCH, in no bid contracts and in violation of the Indian Child Welfare Act of 1978. 9. Another no bid contract of 5 million dollars to Manpower to recruit 1000 new employees in 3 years. It only got 83 in the first year. While All of this waste was/is happening Governor Rounds cut education funding 5%, and thenafter not answering questions about education funding during the 2010 campaign, Dennis Daugaard cut it by 6 1/2% in the 2011 legislative session. And now, Governor Daugaard is turning down tens if not hundreds of millions of federal dollars by not expanding medicaid to cover those who are working but make too much to be below the poverty level but not enough to get a subsidy to purchase their own helath insurance, simply because he is opposed to Obamacare which his friend Mike Rounds helped establish. Speaking to the Pennington County Republican Ambassadors Luncheon on the day after the 2010 election Dennis Daugaard is quoted by Kevin Woster in the Rapid City Journal, "In their hearts, South Dakotans usually do what's right," he said. "And they don't need the government to tell them what's right." Including Mike Rounds there are four choices for US Senator. Including Dennis Daugaard, there are three choices for Governor. Let's hope that the voters do what is right on November 4th. There He Goes Again. Mike Rounds Makes A Mockery Of His South Dakota "Values." Over and over again, Mike Rounds presents himself as the champion of South Dakota "values," promising to bring those "values" to the United States Senate if he wins the race in November. Yet just as repetitively during the course of his awful campaign, events and his utterances have betrayed the fact that he doesn't give a hoot about one of the most basic values treasured by South Dakotans (heck, treasured by people everywhere): being a man whose word you can trust. We already know the voluminous amount of mis-statements he's made regarding his involvement with the Slaughterhouse EB-5 fiasco when he was governor. They just go on and on, and where they'll stop, nobody knows. Now just in the past couple of days he's come up with a couple of doozies that are so outrageous that 1), they reinforce his reputation as a guy who's willing to say anything if it suits him, true or not, and 2) they give the impression that he thinks the South Dakota electorate is so stupid that he can get away with coming up with anything. First off, there's that ridiculous canard about the Keystone XL pipeline creating 40,000 jobs that just turned up in a National Republican Senatorial Committe tv spot. Are this man and his supporters ignorant? They come up with that fantasy number in this anti-Rick Weiland video. I continue to believe that the pipeline has some positive political value for Republicans in South Dakota, but touting it as a job creator isn't one of them. I mean, where does Rounds, through his NRSC honks, get off claiming 40 thousand jobs will materialize if the pipeline is built? Even the pipeline's company, Transcanada, has said that it would create just 9,000 temporary full and part-time jobs. Transcanada won't even comment on how many jobs there will be after construction is completed. For its part, the U.S. State Department has said that it believes 50 permanent jobs will have been created once the pipeline is finished. How Rounds and his supporters could have conjured up that 40 thousand figure is something known only to him and his outside ad-meisters. The second repugnance occurred over the weekend, when the Rounds campaign blithely claimed in a full page ad in the Rapid City Journal that "sending Rick Weiland to the Senate is part of a plan to kill the B-1B." The RCJ's newsroom followed up with an excellent piece by Seth Tupper clearly showing that Weiland's endorsement by an anti-nuclear armaments organization can't possibly be construed as an attempt to "kill the B1-B." For one thing, experts in the field of United States Air Force technology themselves say "the B1-B no longer carries nuclear arms." That being the case, the organization that endorsed Weiland (Council For A Livable World) labeled the Rounds charge "incorrect . . . made up . . . and false." Pressed for an explanation, Rounds' campaign manager Ron Skjonsberg, didn't address the specifics, just made some general remarks about Obama and CLW being "undeniably bad for Rapid City." I invite Skjonsberg (or anybody from the Rounds campaign) to explain specifically how Weiland's election would be "part of a plan to kill the B-1B." If there is indeed a "plan" out there, we all need to know it. Come clean, Round campaign. Give us some of the details of this "plan" that you claim exists. You can do it right here. The comments section is wide open and eagerly awaiting the news of this "plan." South Dakota is in the national news this political season as the race is heating up for retiring Tim Johnson’s seat in the U.S. Senate. Once a shoe-in for Republicans, the race has tightened as South Dakotans take a long look at the Republican candidate, Mike Rounds, and his involvement in the EB5 program and the failed beef processing plant in Aberdeen. The investigation is long and involved, but if South Dakotans are interested in what kind of a man they plan on casting their vote for in November, it would behoove them to pay attention to what is going on with this incident. I have never held back when it comes to Mike Rounds and have expressed concern about his politics, his sense of entitlement and his dishonesty in the past. His attitude toward those who disagreed with him while he was governor was appalling. He acted like a spoiled child who was raised to believe that he was the golden child and those who would question him needed to be put in their place. Rounds has skirted the EB5 issue as he has always danced around when being pushed in a corner. He denied knowing about or ever seeing the subpoena that was delivered to his office concerning the Darley lawsuit. Then he said it wasn’t a subpoena, but simply a notice of arbitration. It was not an arbitration notice. It was notice of a new lawsuit demanding the state’s appearance in court. He made a false statement to the legislative committee in his answers concerning the subpoena, and then backtracked and asked if he could change his answer once it was proved the legal papers had been served to his office. The tougher the questions about what he knew about Joop Bollen’s finagling of the program, the louder he yells about repealing the Affordable Care Act (ACA) and defeating anything the president has to offer. In the first candidate debate, Rounds harped long and hard every chance he got to push that agenda. His answer to every question was to avoid answering it and parroting the same mantra of taking back the Senate, repealing ACA and stopping this president. It’s the attitude that has held this Congress and this country back from recovery from the recession and has kept them mired in the do-nothing cycle that pushed this nation to the brink of a disaster on numerous occasions in the past six years. It is getting old and tiring to hear the only purpose of the next two years is more of the same. South Dakotan Republicans are being pressured to vote for Rounds because the Republicans need this seat to take control of the Senate in order for them to push their agenda through both houses of Congress without opposition. But we are people of common sense. We are honest, kind to our neighbor and patriotic. We have always stood head and shoulders above others in support of our military and in our country in times of war. We are ahead of the average American when it comes to history and tradition because we hold on to ours with pride. We embrace the labels of backward and behind the times because what we hold onto is better than what others have. We still have the pioneer spirit, work our butts off and accomplish more in a couple of days than most do in a week. We accomplish more in a couple of days than this Congress has accomplished in a full year of work. We do it for a lot less than Congress gets paid. Yet we are considering sending another do-nothing politician to the U.S. Senate. Despite what the commercials are telling us, Mike Rounds does not have the same values as most South Dakotans. Listen to what those sound bites are conveying. Think about the dishonesty of the Rounds campaign. This is the candidate that used information about the ACA robbing $750 million from Medicare in order to frighten seniors despite the fact that the information was false and he knew it. He admitted to that. This is the candidate that keeps changing his story when pressed about the EB5 Program and his role in it. It is this candidate who vilified federal stimulus then accepted money earmarked for education and used it to balance the state budget so he could claim he worked with a balanced budget all his years in office. There are other options besides Mike Rounds. Do we really want to send another man to Congress who may just end up coming home to face criminal charges in connection with EB5? If Mike Huckabee Can Come Out Here And Give Rounds A Boost, What's Stopping Tom Daschle and Senator Johnson From Doing The Same For Weiland? I've never been much of a fan of that perennial scold Mike Huckabee, but it's obvious he's got a decent-sized following in the Republican community. Huckabee brought the full weight of his support for Mike Rounds to South Dakota a couple of days ago, returning the favor that Rounds, when he was SD's governor, did for him during the '08 election cycle when Huckabee ran for the GOP Prez slot. Rounds was on the Huckabee bandwagon early on and stuck with it even as the morality-themed campaign came apart. Huckabee subsequently found work hosting a show on Fox News, where he remains a fixture, giving him just enough star-power to attract plenty of attention to the Rounds campaign and get a few people's minds off Slaughterhouse EB-5 for the space of a couple of hours. The standard political dog-and-pony show gave the Rounds campaign some great face time on SD media, which should jog some Democrats into wondering why on earth they can't get some of their own star power into action around here. The Senate race has tightened up to the point where every little bit of attention can make a serious difference, and now that the Rounds camp has had its moment in the star-shine, Dems could use an offsetting event to even things up a bit. I've already gotten on Tom Daschle's case about his disappearing act now that his one-time employee Rick Weiland has the election within his grasp. Considering that Weiland worked for Daschle's first campaign for Congress back in '78, which Daschle won in a squeaker, a brief appearance by the former Senator and congressional party leader would make for a nice acknowledgement, if not a de facto thank you. As a practical political matter, it would also get tons of media exposure and might even help galvanize some ground support for Weiland's final push in this contest. Same thing goes for retiring Senator Tim Johnson, whose seat is the object of this race. Though the star-power quotient for Johnson is nothing like Daschle's or Huckabee's, the long time Democratic Congressman, whose career in the U.S. House and Senate spans decades, seems disquietingly reticent about entering the fray. Given that on a national scale it looks like a stops-out effort by both parties to get control of the Senate, Johnson's observation post on the sidelines seems lacking in concern about his party's fortunes. The only clear mention of Johnson's support I've seen comes from Weiland's facebook page, from way back in May, 2013: "Rick Weiland has a good opportunity and I've encouraged him to run," said Johnson. A few days ago on a trip into Rapid City Johnson said, "of course I'm in favor of Rick Weiland, but they're all good candidates and I'll stay away from the politics." Johnson has certainly earned the right to go into terminal tepidity, but I know people who worked like the dickens--me included, via my family--to get him re-elected a couple of times that are very disappointed by his lack of enthusiasm for the Weiland campaign. Dems in South Dakota could use a few elder statesmen to speak out. Why their reluctance to do so? Please Mr. Postman, Look And See--Is There A Letter In Your Bag For Me? Apparently there is. As a registered Republican I should be getting this missive from my party any day now. Cory Heidelberger over at Madville Times just published it on his blog with a notation that it would be going out to all registered Pubs in SD. Titled "The Bottom Line On EB-5," the dispatch aims to defend South Dakota's Republican-dominated officialdom from what it considers "politics-playing" Democrats who are "manufacturing a scandal about EB-5 through innuendo." Cory gives a good point-by-point refutation in his blog. It might be easy enough to dismiss as politically motivated before you read it but will prove difficult to wave off if you take the time to go through even a few of the points covered. Way too long and detailed for coverage here, the dispatch nonetheless raises a couple of major points that we can discuss. First off, there's the fatuous claim that this is all about politics. No doubt some serious political gain is accruing from all this to Democrats, who'd be crazy not to take advantage of it. But Dems didn't create this fiasco--it all happened when Republican senate candidate Mike Rounds was governor just a few years back. And perhaps the most pointed critique and analysis of the whole mangled mess comes from the non-partisan, non-profit Center for Immigration Studies in Washington, D.C. In another piece, CIS pegs the loss to South Dakota at $120 million. I note that the author of the articles comments on the "cozy politics" of South Dakota and singles out retiring Democratic Senator Tim Johnson for not having said a thing about this. It seems pretty clear that from a non-partisan outsider's perspective, this is an equal-opportunity quagmire. I'm a Republican myself and have been since I first registered in '68--and I'm as anxious to find out what happened as anybody else. That the SDGOP letter claims the investigations into the mess have been "vigorous" is actually laughable. When the Republican-dominated state legislature's Government Operations and Audit Committee held what amounted to a kangaroo hearing on this thing last month, it didn't even seek to have Joop Bollen, the central figure in the fiasco, testify. And candidate Rounds was allowed to respond to written questions with written answers, the substance of which he didn't get right and subsequently had to amend after a tipster called him out.The GOP calls this a "vigorous" investigation? Something carried out forcefully and energetically is "vigorous." GOAC's limited, limp-wristed and superficial one-day pro-forma "investigation" was about as antithetical to "vigorous" as it could have been. I'd say "feeble" is the more accurate description of it. Most absurd of the SDGOP's claims in this letter is that Republican leadership has been "forthright." Good grief. Does the fact that Mike Rounds has delivered mis-statement after mis-statement about his involvement in this financially catastrophic loss to the state come across as "forthrightness" to the letter's writers? Rounds has tried to put it all on the Regents, claimed he never solicited investors, said he never got legal papers served on him, denied involvement in day-to-day acitivies--all proven by facts to be false. Try as the party might, no mis-characterization of the GOP leadership's handling of this matter will make it go away. Nor will its glibly oblivious attitude toward $120 million being lost to the State of South Dakota lessen the magnitude of the scandal that occurred during its watch. Does Outside Money Raised By Other People Coming In To Help Rick Weiland Make Him A Hypocrite? Mmm, Not So Sure About That. The sudden surge of money from sources outside his campaign has been quite the boost for Democratic senate contender Rick Weiland. Given the "cry poor" theme of his campaign for most of the year, Weiland's sudden good fortune in the form of our bombardment of an expensive array of anti-Mike Rounds ads has rankled quite a few folks. The ads are produced and paid for by national sources looking to boost Democratic chances in the race for control of the U.S. Senate, and they've brought out shouts of "hypocrisy!" from the opposition. Why? Because until lately, Weiland's shoestring budget was consistent with his theme of "taking it back" from the well-financed establishment--mainly Republicans--who Rick's campaign has pictured as the rich and powerful folk who run the country to their liking. Now suddenly, Rick's cash-laden supporters make him look like he holds his own among the rich, if yet to be powerful. Those who react by declaring Weiland to be a "hypocrite" have a political need for doing so, but I really think their logic falls short on this one. To be sure, the Weiland campaign has never been particularly well-received by me, and I doubt that he would be seriously contending for the seat if Republican Mike Rounds' awful handling of the EB-5 scandal hadn't hobbled what seemed to be his cakewalk into the U.S. Senate. Weakened as the Rounds campaign has been by that noxious reminder of his flawed governorship, national Democratic and liberal organizations have seized the chance to give Weiland's race a financial boost, and the millions have poured in. Does this make Weiland a hypocrite? No, it just makes him another participant in realpolitik. Recall that in 2013 Weiland tried to get the Rounds campaign to join him in a pledge to cap all campaign contributions at $100.00. Rounds had just announced plans to raise $9 million for the campaign, no doubt pouring on the financial intimidation early on. Freaked out as he probably was, Weiland countered with that pledge idea, likely knowing full well that Rounds' people would dismiss it out of hand. Thus was born Weiland's populist I-ain't-got-a-barrel-of-money campaign. Now that big money is coming in--independently of the campaign, it's important to note--Rick is being called on to reject it. He's already made public requests for the money to stop, but, because of the outsiders' very independence, Weiland has no power to influence those that are spending it. As I understand it, campaign finance laws exclude any conversations between Weiland's campaign and those outside sources, and unless proven otherwise, I believe we have to assume that there are no under-the-table contacts either. I really don't see much in the way of hypocrisy here. Groups that want Weiland to win--or, as I see it, are more intent on Rounds losing--are free to bash Rounds at will, which is what most of them seem to be doing. Rounds and his mismanaged campaign, so far unable to gain support from much more than a third of the electorate, are probably more responsible for these outsiders pouring in than anything Weiland has said or done. Why Is Mike Rounds Suddenly A Front Man? Mike Rounds, teabagger? When the Tea Partiers came 'a callin' to Rapid City yesterday they did so to give their blessing to Mike Rounds as their kind of Republican. Which is weird. 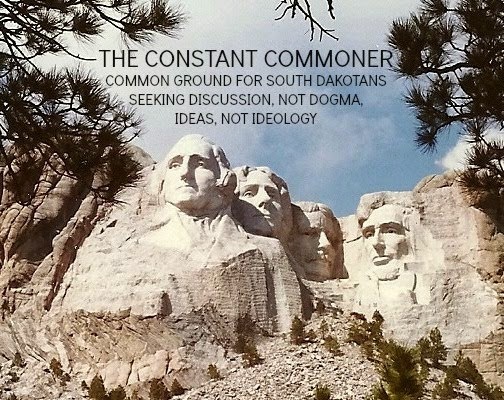 Rounds has been touting himself as the personification of "South Dakota common sense" and "South Dakota values," which to my way of thinking pretty much rejects, on both scores, the extremist demands of the Tea Party and its "my way or the highway" approach to the political process. I wouldn't call this "common sense" by any measure. Nor does it reflect any but the most extreme set of "values" when it comes to running a government. The Tea Party's heavy hand caused the near-ruinous shutdown of the federal government a year ago. It was especially painful to South Dakota. I know it personally, having business interests in the hospitality industry. Tourist businesses in the Black Hills were sucker-punched when the Tea Party-inspired shutdown took place, mainly because the TP's handmaidens in Congress (Kristi Noem among them) wouldn't compromise over a spending measure for the Affordable Care Act and mustered up the votes to close down the federal government altogether. The result around here was terrible, what with Mt. Rushmore, Badlands National Park, Wind and Jewel Caves, Devil's Tower and any other federal park facilities gated and closed for the duration. Things got so bad that a consortium of local tourism entrepeneurs actually passed the hat and collected enough money to operate Mt. Rushmore independently of the federal government. The nightmare ended a few days later when the TP's naive political tools realized what their impetuousness had wrought. But the damage was done. The Fall tourism season was shot. Meantime, ranchers who'd just been devastated by last year's October blizzard had no federal support to give them some much needed relief because all of their disaster assistance offices were closed. It got pretty crazy, and all of it was Tea Party-inspired and -driven. So just a short year after this show of uncompromising force and callous disregard for his potential voters in South Dakota, Mike Rounds is suddenly enamored of these extremists? "We accept it, we wholeheartedly accept it" said Rounds of the endorsement. Please. Kristi Noem was bad enough a year ago when she went along with the financially disastrous kookiness. Now Mike Rounds wants to be a front man for these zealots. I don't know whose version of "common sense" Rounds is pushing, but fronting for the Tea Party and its utter disregard for the needs of the "common" folk in order to promote its ideological agenda doesn't make a lot of "sense" to me. Drey, I have not yet seen this point disputed by any officials who might have been involved. As far as I know, none of the financial records have been opened to public view. As Bollen's deposition comes out via Bob Mercer's blog/column (Aberdeen American News) some figures might show up. Drey Samuelson Thanks, John. My guess is that, if it were in error, Rounds' campaign would aggressively challenge it, but all we hear from them on this is crickets. $120M would cover the "structural deficit" that Rounds left the state in, which caused all sorts of chaos (including drastically lowering state aid to education, among other problems). Jeremiah M. Murphy Drey, as Bob Mercer reported in January of 2011, part of the basis for the deficit was state aid to education. Describing the cause of the deficit at the end of Rounds' second term, Mercer wrote: "Legislators repeatedly succumbed to pressure by public school lobbyists for extra money in various forms while Rounds was governor." Nick Nemec Without regard to education funding there is still $100million or more missing. Where is it? Why hasn't Joop Bollen been charged with some crime for unilaterally issuing and signing a contract with himself? Drey Samuelson Jeremiah--okay, I'll concede your point. Care to comment on the lost $120M? Tiffany Campbell Is Jeremiah really blaming education for Round's deficit? SD pays it's teachers the lowest in the nation! Let's go back to 2010 when Dauguuard said there was no deficit, is Jeremiah admitting that Dennis lied in his TV ads? Jeremiah M. Murphy I quoted Bob Mercer on education funding's role in the deficit. I have no idea if Daugaard lied in his ads. I know the state has always balanced its budget. That's a legal requirement in SD. I'll be curious to see if any money was lost via EB-5. Tiffany Campbell It is a legal requirement to balance the state's budget, so why does Rounds tout it as a highlight? Jeremiah M. Murphy Mmmmm, politics? John Tsitrian We're all curious, Mr. Murphy. What do you suppose it will take for an accounting to emerge? Drey Samuelson All I know is that rough number $120M-$140M has been used repeatedly as an estimate of how much money the State didn't receive in EB-5 funds that apparently went to Joop Bollen and his cronies, and it has yet to be disputed by Mike Rounds' campaign, or anyone else, for that matter. Jeremiah M. Murphy I didn't get into this post to defend EB-5 administration. I just wanted to point our Drey's overreach above. But, I can't help but notice that the "deeper analysis" you post seems to reduce the $140M to $80M and then further indicates that the fees charged by Bollen are way more, multiples more, than any state charges. That would seem to undercut the claim that what Bollen received would have been received by the state had Bollen not privatized the deal. As I said above, I'm watching this unfold. So, far, the unfolding process appears to indicate a diminishing harm than was originally claimed. Jeremiah M. Murphy Well, thanks to the article you posted, we are seeing. Thanks. John Tsitrian I note that the CIS piece couldn't get data on fees from most regional centers, but that from those that did release the info, fees ranged from $30k-$55k per investor. If SD were charging the upper end of that already established range it would have been competitive and the sums would have added up quickly by factors of tens of millions. Add in the annual fees of $10k per investor claimed by Jeff Barth in his court filing, and the sums can get to be enormous, especially by the standards of a small state like South Dakota. I'm confident that Kathy Tyler's numbers are solid. As to undercutting the claim that Bollen received more than the state would have, I don't see it. These foreign Investors could have easily abandoned South Dakota if they thought the fees were excessive. Bollen knew his market and successfully collected what the market would bear, and he did so on his behalf instead of the State of South Dakota after conniving the business away from us. Take the last word, and thanks for an illuminating exchange. Mike Rounds Is Delusional And Desperate.